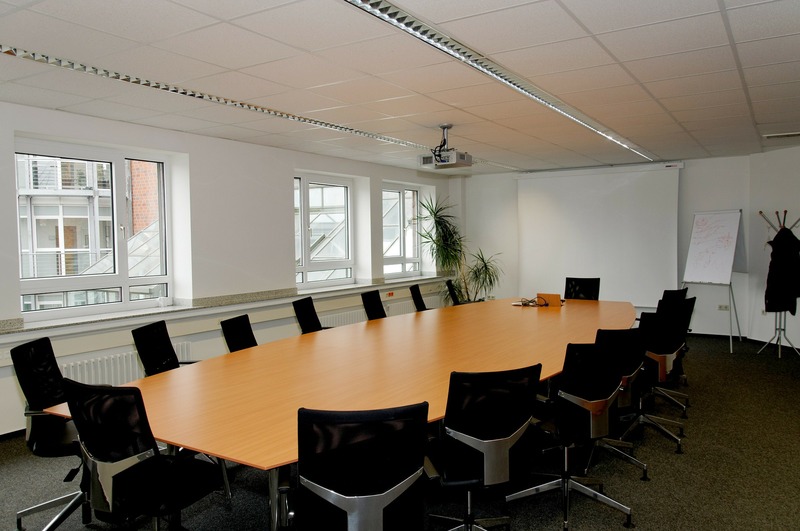 Why Should My Company Have a Conference Room? Conference Rooms. Huddle Rooms. Boardrooms. An area where meetings between peers and clients can take place within the office which is away from the normal workflow is sometimes a nice change of pace for those who need to focus on more daunting tasks or for a brainstorming meeting. What makes a comfortable and effective conference room? What’s the best atmosphere to develop when planning such a room? Which equipment should you purchase when you set up the technology in the conference room? As you can see in the above clip from the iconic film Attack of the Killer Tomatoes, planning your conference rooms starts with understanding your available space for size requirements. Many offices make an attempt at utilizing available space for conference rooms, which can leave meetings awkward and uncomfortable when you realize there’s no space to effectively present to an audience. Proper Boardroom planning starts with knowing your limits and restrictions. Once your know how much space you have to work with, then you can plan your furniture and tech. Conference rooms are usually defined by a few key elements. A long, rectangular meeting table to seat the board and staff surrounded by large, comfortable chairs to allow the right amount of support for those elongated meetings. The majority of these rooms are filled with ambient lighting, little décor to keep distractions minimal, and look almost hermetic, which doesn’t allow for a very creative atmosphere. Adding a splash of color or a bookshelf, something which makes the room more comfortable and less clinical may increase the productivity of those in the room. Motivational posters, paintings, small statues, oddly colored curtains. Not many of the movies in Hollywood depict large, corporate huddle rooms with creative splashes. Something that makes the workplace more fun and creative, a chalkboard wall or even a SMART Board in the room for brainstorming ideas, for example, can allow a creative outlet for the room, and such decor can also inspire a more thoughtful and expressionist environment for the employees. What conference room would be complete without the basic conference room technology? A large screen and camera setting to do conference calls with out of city clients, for example, is something most businesses find crucial when putting together such a room. A projector to help display presentations from different departments mounted to a vantage point on the ceiling which can allow for the sharing of charts, graphs and other data which is pertinent to the productivity of those involved. A good phone conferencing system, audio visual system, and even a recording device of some kind can be helpful in such a room to help capture ideas which some may forget to write down. Huddle rooms, conference rooms, gathering rooms, board rooms, meeting rooms, whatever kind of room you wish to have within your company, allowing it to have a personal feel and an added expression of individualism to help influence productivity is incredibly important. Having this room to the side to express thoughts, ideas, share in a lunch meeting with clients to go over new strategies, or to do quarterly presentations using state of the art equipment can help the productivity of the individuals within the workplace. These rooms have their own charm, but to make them too plain and too clinical can lead them to lessen the amount of excitement in entering the conference room for even the most exciting of meetings.